In the first of this series of guest blogs from wedding experts, Jo Lewis from The Perfect Marriage tells us all we need to know about planning the morning of your wedding from a hair and make up perspective to make sure you have an enjoyable and memorable time, rather than arriving at the ceremony a ball of stress! Along with make up artist Jo Edwards, Jo is part of the lovely duo, The Perfect Marriage. They have 20 years of professional experience and know a thing or two about making brides look beautiful and ensuring their wedding mornings are blissful and not stressful! Let’s hear what she has to say shall we? You’ve spent years and months planning this perfect day, all organised to what you hope to be perfection from the ceremony to that very last dance, but have you paid much attention to the running of your morning from wake up to the ceremony? Your actual wedding is likely to be from around 2pm to 12pm on that chosen day, and that flies by, I’m sure you’ve been told this by many. 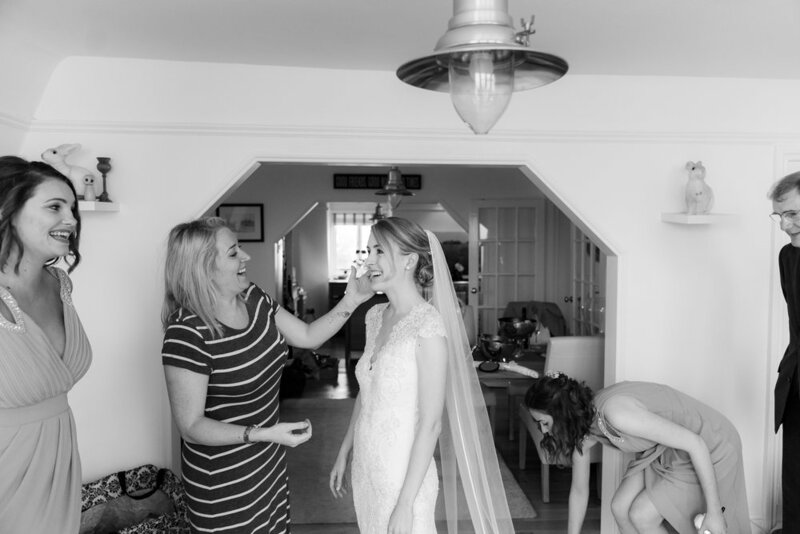 As well as being part of our brides’ journey, providing amazing hair and make up we try and guide our brides towards remembering that getting ready in the morning is very much a part of your big day. Done well it may make some of your favourite memories, or not done well may become a stressful and panicked blur! One of the things our brides feed back to us is how calm we kept the morning and how everything ran like clockwork. In the planning process we consult our brides on a number of matters and make them a bespoke schedule that we send across before the day and also bring with us. The worst stories we have heard of from so many people is running out of time to have hair and make up finished properly, or actually running late to the wedding because of it! Many hair and make up people ask the bride what time they want them and just turn up without planning how long they will need per person or what time the bride actually needs to dress and leave. It is our responsibility as professionals to assist in this part as the bride has probably not had a wedding morning before whereas we have been at hundreds. If possible wake up where you are getting ready – having to travel halfway through the session is always going to cause stress. Know the number of people having hair and make up and plan this with your professional. Think backwards from what time you need to travel to church, or see registrar if at a venue, time for any photos with bridesmaids, a little time to just breathe and relax, time for dressing. It takes a lot longer than slinging on work clothes and then there is perfume, undies, jewellery……. Do you/your photographer want time allocated for certain shots or are they happy to just take working shots? Make sure your bridesmaids have thought about what they would like done with their hair, preferably with some screenshots to show and know when their time slot is. You and all your party are having false lashes make sure your make up artists know – This adds on a fair bit of time per head. If children are having hair done keep them out of the way and just to be done near to the end, I have seen many a child roly poly over my beautiful creation! Mums often like to be done first so they can potter around/stress/ feel busy! Think about when you may want to give out any bridesmaid’s gifts as it surprising that you struggle to fit that in if not planned! Has everyone showered, washed hair or dried hair for the hair and make up team’s instructions? 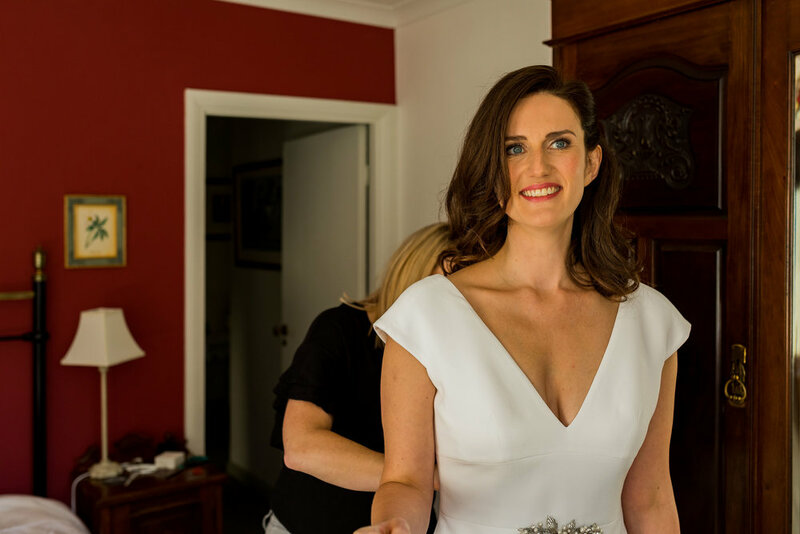 Assign yourself a questions person – On my wedding day last year Jo Edwards our make up lady told everyone they weren’t to ask me any questions and she would field any to shield me from stress and queries #bestbridesmaid . Its amazing how many stupid phone calls people get from guests on the morning asking for directions, and what time their room will be ready! Get your bridesmaids to be dressed before you want to get in your dress as you will want their help! If possible keep visitors to the room to a minimum, it can start to really stress the bride when cousins and aunties keep popping in to see ‘How you’re feeling’! Lastly enjoy every second – Look around your room, surrounded by your favourite girls and realise it’s a very special time!! Or just book us – Jo and Jo from The Perfect Marriage, with over 14 years experience working together as a team we will make sure your morning is as good as the main event! Thank you so much Jo for sharing your wisdom with us, such valuable advice for anyone wanting a stress free wedding morning! You can check out The Perfect Marriage on instagram here. So You Want A Photo Booth At Your Wedding?